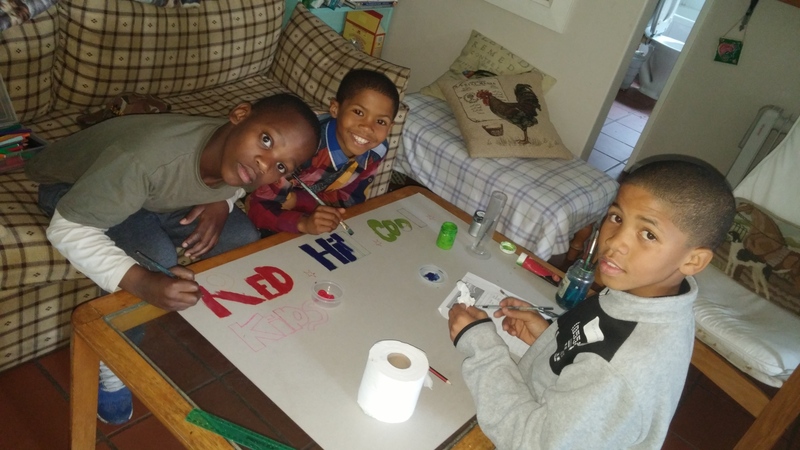 On Sunday we had the privilege of spending 4 hours with Khanyo & Jeremiah (both 11) and Elridge (9) who are the test pilots for the Young Entrepreneurs Outreach project. Awesome kids, sadly the girl in the group had to stay home to do the housework! They had some basic business theory, accounting, salesmanship instruction and made everything from scratch themselves. 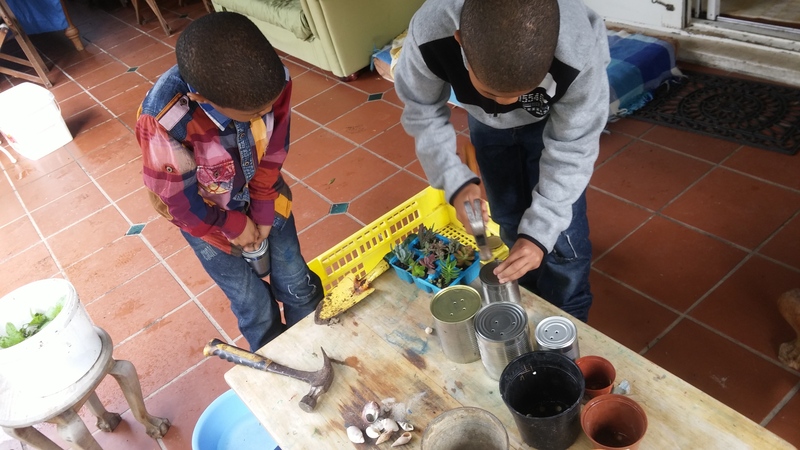 Their stall is now stocked for the 5 Sept Market with lovely bottles of home-made tomato sauce, a selection of plants and a crafty “make an instrument” activity. They made an advert and sign and calculated their costings and potential profit as well as making labels, etc, etc. I’d love to get them a prize to raffle too. It looks like each child will net R100 with enough over to reinvest for the next market as only the first one is subsidised. We will continue to help them making their goodies but they will have to fund themselves from here. Massive thanks to Nikki Mountifield for all the help and supplying the lunch. 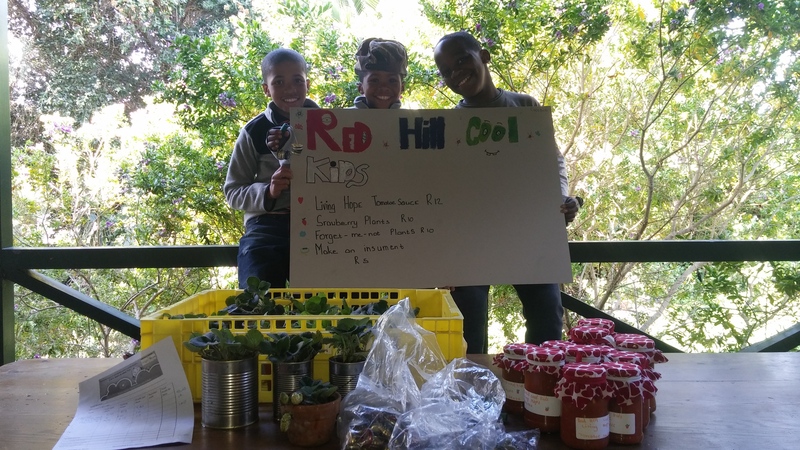 These kids will also need a bit of pocket-money for market day so they are not tempted to spend their takings. Anyone keen to step up maybe? A little goes a loooong way. All this today was done with just R60! When I asked what they would spend the money on, they all said, “Food for the people.” No sweets or soccer boots on their list. 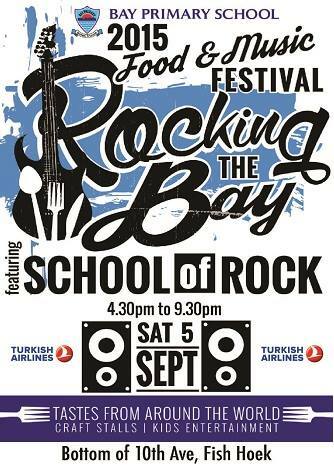 Come and sample their wares at Bay Primary School’s Fair on 5 September from 4 to 7pm. Next month I plan to stock 10 stalls with 40 kids and hopefully Living Hope will give us premises to work in. We need lots of volunteers and donations of materials and cash to make this work. A little goes a very ong way! I am also desperately seeking sponsors for prizes, certificates, signage and costs of the Pocket Money Market as a whole, including both the main and outreach sections. Anyone interested in assisting in any way please get in touch on 0833840590.